On-disc adhesive labels can convey a variety of appearances based on the selection of paper and print type. These varieties include inkjet or laser print formats in a glossy or matte finish. These CD labels are an extension of the disc and are not manufactured onto it. Separate disc labels shield from potential damage by equipment and streamline the printing process for at-home users that aren’t equipped with tools for direct disc printing seen at printing houses and duplication service companies. Additionally, laser and inkjet printers employ different technologies when it comes to printing. Laser print labels are solely compatible with laser printers. It entails the machine’s laser beam projecting a digital copy image onto a rotating drum. Static electricity adheres ink to the drunk using an ink roller. The drum becomes coated with ink in areas that have a negative charge. The negatively charged areas of ink slowly comprise the image. Heat and pressure combine to make a permanent image on the paper. Laser printing is faster than inkjet and uses a single cartridge of toner. However, they are more expensive to purchase initially but inkjet cartridges may be more expensive to replace over time. Laser printing also provides on-disc labelling with higher resolution of text and imaging. Inkjet disc labels are strictly used with inkjet printers. These function by forcing ink out of nozzles using thermal resistors or vibrations of an electrical current. These pulsations of pressure spray millions of minute ink dots that combine to recreate an image or text. Since they consist of countless ink pixels, it takes longer for the printer to formulate an image compared with laser printers. They also use multiple cartridges to choose image colors from, which can add up to the long-term cost of the printer. Inkjet is the primary choice for on-disc labels if superior color and saturation is your priority. 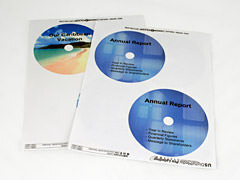 Gloss and matte finishes on inkjet or laser printer compatible paper are an additional selection that must be made when choosing on-disc labels. They boil down to personal preference in that their two main points of different are their cost and presentation. Matte on-disc labels are economical, they are less than half in cost compared with glossy options. They are also better for practical project applications where a softer, more subdued look lends itself to the audience or user. However, if a full color image is printed onto a matte label, attention is drawn away from the finish and more toward the image. This may allow the budget to be focused more on full color ink rather than the paper finish. A gloss finish provides an almost laminated look. Its shiny, reflective nature can make the images truly stand out. Subsequently, gloss has the ability to mask any artistic shortcomings the image or text may reveal. However, glossy labels are more expensive than matte—often more than twice as much. A standard matte CD label may cost $8 USD for 100, but the same amount of labels in gloss will cost more like $20.